Dana’s molded gaskets include many different rubber gasket designs to seal joints in engines and transmissions, which improves durability and reduces downtime in light-vehicle applications. Carrier style gaskets seal components with a plastic or metal carrier fastened to a specific elastomer. This creates a steady pressure to secure components with an unbreakable seal, better protecting the engine and extending product life. 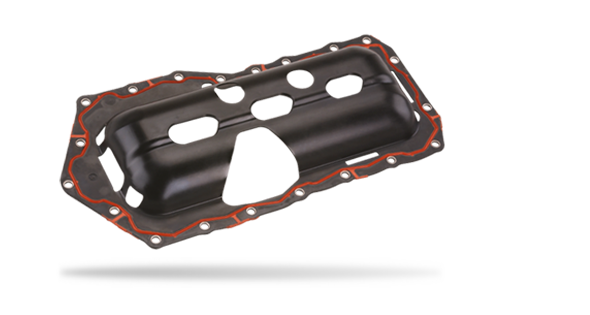 While our molded pressed-in-place gaskets are completely compacted in a metal-to-metal joint groove in die-cast front covers, oil pans, and other housings with an as-cast groove. Retention features of the material provide a void/volume, self-retaining design for superior sealing pressure, which helps enhance durability. Edge bonded gaskets are used when the gasket is molded onto an edge of a rail for structural joints with high loading, and are ideal for medium-pressure applications where the created force acts as a self-sealant. Cured-in-place gaskets use a robotically applied sealing bead to ensure consistent placements. Elastomeric sealing technology is applied in this molded gasket without the cost of injection molding for low volume applications. These gaskets are typically used in covers, water pumps, and parts that require a solid joint between the gasket or parts with low wall depth.